The USA government says the economic future of Zambia will depend on the country’s peace and democratic success. The USA further says it regrets the divide that has emerged among Zambians and the way this is affecting the reputation of Zambia on the international scene. 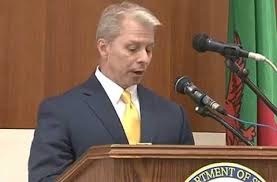 Speaking on USA national day, US ambassador to Zambia Eric Schultz said Zambia has come too far to sacrife the needs and rights of many for the narrow political interests of a few. When he declared a state of emergency, Zambian dictator Edgar Lungu said some Zambians will lose their rights and the IMF can go away if they wish. ‘The economic future of this country rests first and foremost, I would argue, on the development of its human capital, something to which we are proud to have contributed. However, it will also rest on the country’s political context: Zambia’s continued democratic success and the long-term peace and stability that it provides. In that regard, in the context of recent events, let me, on behalf of the United States, appeal again for Zambians to reconcile with one another politically so that the country may move forward together to a bright and prosperous future. We regret the divide that has emerged among Zambians and the way it has affected international perceptions of this country. At this juncture, dialogue, reconciliation, and respect for due process and civil rights are more important than ever. We call on all Zambians, no matter what political affiliation, no matter what ethnicity, to exercise restraint and engage in positive dialogue to resolve the country’s current political difficulties. We call upon all Zambians to preserve and to protect Zambia’s reputation for democracy; its reputation for peace; its reputation for civility. Zambia has come too far, and has too far yet to go in its development, to sacrifice the needs and rights of the many for the narrow political interests of the few. July 4th is a celebration of democracy and its virtues. We believe that it is the one system of government that can best promote a country’s development because it is the one form of government that derives its authority from the will of the people.